Philanthropy has always been an important part of the Tata & Howard philosophy. 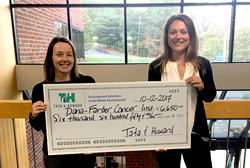 Tata & Howard, Inc., a leading innovator in water, wastewater, stormwater, and environmental engineering solutions, raised $6,650 for Dana-Farber Cancer Institute (DFCI) in Boston, MA. Employee-owners donated $3,325 and the company provided a 100% match. Enhancing the company’s support of DFCI, Tata & Howard Marketing Communications Manager Heidi White raised $4,290 for DFCI through their Run Any Race program in September, and Assistant Project Engineer Molly Coughlin is once again running the Boston Marathon to raise funds for Dana-Farber in 2018. Her personal goal is $15,000 after raising $9,400 in 2017. To support DFCI and the life-saving research and treatment options they provide, please visit http://www.danafarbergiving.org. Dana-Farber Cancer Institute, a principal teaching affiliate of Harvard Medical School, is world-renowned for its leadership in adult and pediatric cancer treatment and research. Designated as a comprehensive cancer center by the National Cancer Institute (NCI), it is one of the largest recipients among independent hospitals of NCI and National Institutes of Health grant funding. For more information, go to http://www.dana-farber.org. Founded in 1992, Tata & Howard, Inc. is a 100% employee-owned water, wastewater, stormwater, and environmental consulting engineering firm dedicated to consistently delivering cost-effective, innovative project solutions. Working with clients as a trusted partner, Tata & Howard provides a full range of environmental engineering services, from concept to completion, as well as sustainable solutions including low impact development and LEED certified building. Tata & Howard has gained a solid reputation as an industry leader in the Northeast by bringing knowledge, integrity, and dedicated service to all sized markets, both public and private. With offices in Massachusetts, Connecticut, Maine, New Hampshire, Vermont, Arizona, and Texas, Tata & Howard’s national expansion has included projects in Louisiana, New Mexico, New York, Idaho, Hawaii, and Pennsylvania. For more information, please visit http://www.tataandhoward.com.